It seems the Boy Scouts of America would prefer not to exist. 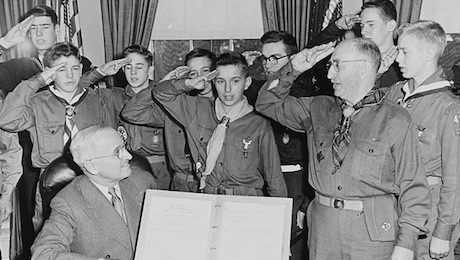 President Truman, sitting in the Oval Office, is updated on the achievements of the Boy Scouts, who are giving him the Boy Scout salute. So the legacy we have is two separate institutions premised on the idea that masculine and feminine identities actually matter—that they are unique, special, each worthy of celebration in their own right, and worth cultivating in the next generation. Yet today, the Boy Scouts organization is perpetually at war with itself—at war with the very premise of its own existence. It is so sad to see how many people fear change, especially if it would empower women or others who have been left out of the loop for so long. It is the politics of fear, the realization of white males that their power is diminishing as women and minorities take a rightful seat at the table. Move over Mr. Davis. And don’t worry too much. The girls will be a lot nicer towards you and your ilk than you have been to them. If I had a daughter, and she was more interested in “scoutcraft… patriotism, courage, self-reliance, and kindred virtues”, why is it a problem? What if her parents would rather she learn things like that, as opposed to selling cookies? Any child should be free to learn woodsmanship. I understand there is a concern that there could be intimate relations between young boys and girls, and that is a valid concern. But likewise, supposedly 10% of young boys are gay (10% of the population in general), and it doesn’t appear people are pulling out their hair in concern about these boys all spending so much time together. Heck, I’ll support them learning self defense and marksmanship, regardless of gender or sexuality. Just because a child is female or gay, doesn’t mean they should be forced to just focus on tea parties and cookie sales. I love your reporting, but coming from my decidedly libertarian perspective, I think you missed the mark on this one. issue ?? Oh yeah that would be liberals, there indoctrination agenda. what the want as boys or girls ……. Sad . someone , like someone who thinks they are a transgender ?? We need Boy Scouts for boys, nothing wrong with being a boy . We need Girl Scouts for girls, nothing wrong with being a girl. We need Gender Scouts, for the Ze and Hir until they find themselves. Wake up America, these fools are ruining America for an Agenda !! I wrote off the Boy Scouts when they changed policy to allow homosexual Scout leaders. A good organization destroyed by political correctness.